The Island is just 18 miles long and 5 miles across at its widest and is usually the last port of call for the Blue Star Ferries ship on the Cyclades run from Piraeus (Athens). There are a small number of hotels and pensions to stay in varying in standards and price but there is one particular small hotel, which is quite exceptional for a secluded island with so little tourism. 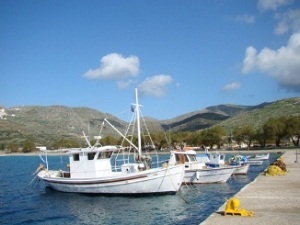 The remote location, excellent walking, the opportunity of peaceful activities and this comfortable charming hotel with its own unique taverna make these programmes an ideal holiday for those who enjoy the outdoor life. Enjoy walking in the mountains and valleys with Special Interest Holidays. 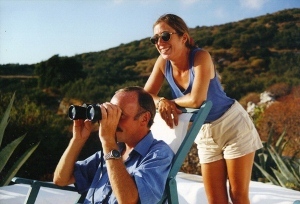 Discover Greece of old but at the same time enjoy the comforts of life. The variety of sites and experiences are endless. 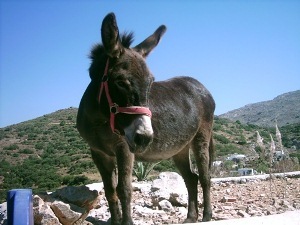 Very few visitors to Amorgos get to see the most remarkable sights here, as they have to be visited by donkey or on foot. It is quite extraordinary walking terrain but a comprehensive walking guide book or a local guide is essential. Some routes are not too difficult to find but often interesting and fascinating historical sites dating back to 5BC, of which people are unaware, lurk just around the corners. We take you where only the goatherds tread, and beyond! 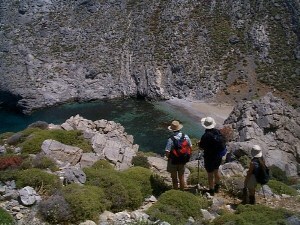 The basic holiday is self guided walking supported by Paul & Henrietta's book ‘Amorgos a Visitor’s and Walker’s Guide’. If clients wish to have a guide this can be arranged on a pro rata basis on arrival. You will be accompanied by one of the specialists from Special Interest Holidays. This will usually be one of the authors of the book. We are ultimately flexible. Please take a little time browsing the pages of our website. If you enjoy walking in the great outdoors in a beautiful and natural environment we are sure it will be worth your while! 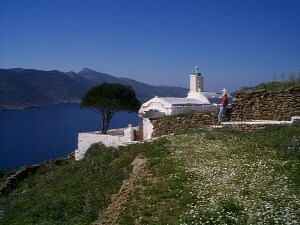 You'll discover some of secrets of the Island of Amorgos - and many more with us in the mountains! We have selected different photographs for each page and there are even more for you to see in the slideshows on the Gallery pages. We enjoyed putting this website together and selecting the photographs from our collection. We hope that you you will have the same enjoyment viewing it. 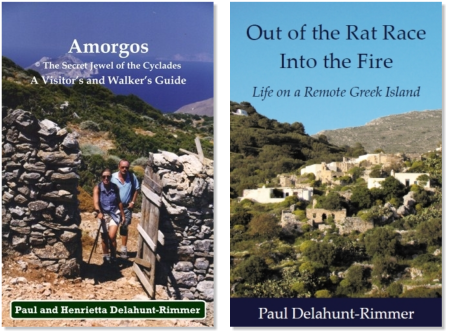 We would be delighted to see you on Amorgos.